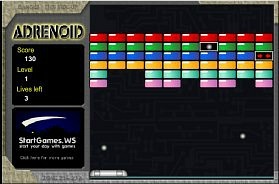 Adrenoid is, quite obviously, a version of the classic 1986 game by Taito, Arkanoid. The object of the game is very simple - clear the coloured blocks without letting the ball reach the bottom of the screen. Warning! Start the game by clicking the yellow "Start Game" and not the sneaky "Press Start" message which takes you to another website. You may also need to install Adobe Flash Player using the button above. The paddle is controlled by the mouse, and you can launch the ball by clicking the left mouse button. There are ten rounds, each becoming increasingly difficult, and you get an extra life at the end of each round. Special blocks will give you extra balls and a wider paddle, although some give you a smaller paddle or faster balls, so be warned! Overall, this is an enjoyable, retro style game, and one that should keep you amused for quite a while.